As existing underlay will weaken in high traffic areas (e.g walkways and stairs), only new underlay ensures the best performance and protection of your new floor. Our underlays are available in various sizes, prices and material such as recycled foam and crumbrubber. Be kind to your flooring and your wallet with this Enchant underlay and enjoy comfort at a great price. 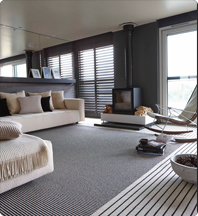 Made in the UK with a fantastically high tog rating of 2.18, this 8mm underlay has a medium density and high tog rating so it's ideal for those parts of your home that experience a lot of footfall such as; stairs, landings and hallways, but it's also just as suitable to use as bedroom, dining room or bathroom underlay. With all the superb noise and heat insulation qualities that you'd expect from Polyurethane underlay, it is made from recycled foam. If you're looking to extend the life of your flooring by up to 40% then this carpet underlay is ideal. Call today for a complimentary consultation. Get a great feeling beneath your feet with a Blissful underlay. Giving you the luxury that you want and the support that your flooring needs to last longer, this cheap underlay is a great addition to any home. Made in the UK, this generously thick 10mm underlay will give you comfort underfoot in every room of your home, and because it's a high density PU foam underlay you can be sure that it will be hardwearing with a long lifespan. With a fantastic 3.13 tog rating and recycled foam you will feel the benefit of this tredaire underlay as its thermal insulation helps to keep you warm and reduce your utility bills. Reduce the sound of noisy footsteps and make the most of your carpet today; order online now!